My Personalised Clothing are the UK's printing specialists, we are passionate about print and proud to offer what we believe to be the best quality products combined with the finest service in the industry! We offer printed t-shirts, personalised hoodies, custom workwear, company uniforms, promotional clothing and so much more to the UK and beyond. We have worked with some of the largest companies and brands in the world, as well as printing orders for individuals and small, local businesses. At MPC, the customer will always come first, which is why we have an award winning customer service team on hand for any customer queries, offer free UK delivery on orders over £50.00 and have a no minimum order policy, with no set-up costs. We are based in Essex, near London, UK, and all production is done in-house. We're constantly on the lookout to expand our ever-growing team and recruit skilled personnel who are just as passionate about printing and providing great service as we are. We strive to provide the best possible customer service so that our customers feel valued and we retain their business. 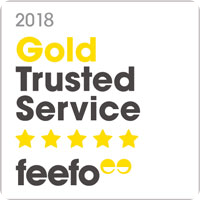 This is why we have won the Feefo Gold Trusted Service Award 3 years running, in 2017, 2018 and 2019. MPC has over 15 years of experience in the print industry, so it's fair to say we're pros. Joining MPC means learning new skills, whether it be trying a new print technique or interacting with customers, as well as applying your current skillset. At MPC, we're proper printers, all production is done in-house and there is a great relationship between all of our departments, so no matter which role you apply for, you'll have great interaction with everyone at the company. The personalised print industry is amongst the fastest growing sectors in Europe, and My Personalised Clothing is at the forefront of that growth. We aim to continue the print industry's growth by providing our customers with simple to use design tools and cutting edge print techniques. At MPC, there's a role for everyone. We have roles that require different levels of experience and different skillsets, whether you're an experienced graphic designer or a recent graduate, as long as you have the right attitude there'll be a place for you within our workforce. There are currently no available vacancies. Please check back soon, as we are always looking to expand our skilled workforce. If you'd like to get in touch, please use the contact form on our contact page.